Hi all, I have been trying to locate the mounting position of the front tow eye on my Lotus Elise 2008 but I cannot find one. Am I turning blind? I have looked everywhere behind the grill but cannot see anything. Any help or photos are greatly appreciated. thanks for the answer @Bibs. My car has certainly not got one of these . Is this even possible? They do rust so it may have been removed. It's a clam off job to refit one as the bolts are within the clam but it's only about an hour to take off by all accounts, ideally a 2 person job. It's worth taking your front grill off (just 2 bolts) to have a look in there to see what you can see. @Bibs Do you mean that its an one hour job to take the clam off? According to a local specialist, it takes about 6 hours!? Not at all, it's about an hours work. Even the book time is 3 hours on and off so 6 hours for one operation is wrong. Even the new Exige clam removal/refit time is quoted as 2.5 hours both ways. @Bibs thanks for the info Bibs, I will check it out. Any idea also where I could get a spare part? 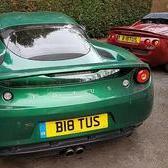 Is this a Lotus dealer only option? @Bibs what a service!!! Thank you so much!